As a project manager you’re responsible for the details. However, how do you manage those details? Sure you’ve got a project plan but that doesn’t track the issues, risks, and detailed tasks that need to get done on your projects. That’s why we created our Project Management with SharePoint DVD. We wanted to make it easy to learn what you need to know to use SharePoint to make it easier to manage your projects. 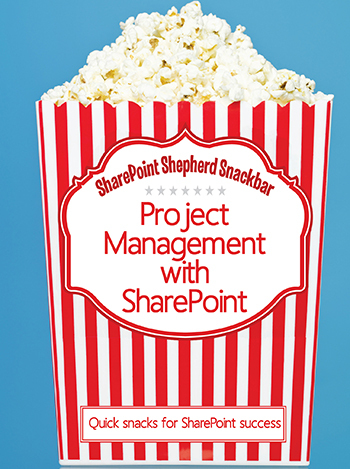 It’s packed with practical information on how to use SharePoint to manage your projects. Perhaps you’re not interested in how to manage projects in SharePoint yet. You’re just looking for cost-effective solutions to train end users on SharePoint. You’ve come to the right place. We’ve got more tools to allow you to create a custom training solution than anyone else. From train-the-trainer DVDs like our Psychology of SharePoint Adoption and Engagement and Nine Keys to SharePoint Success offerings to our quick reference cards to our SharePoint Shepherd’s Guide for End Users: 2013 Corporate Edition we’ve got you covered. You won’t find a more comprehensive and flexible set of customizable offerings to help you implement SharePoint anywhere. We’ve even got you covered if you need instructor led materials. If you’re looking for materials that exactly match your environment, we’ve made that easy too. You can start with the Shepherd’s Guide and replace all of the images quickly and easily so it looks exactly like what your users will see — down to the menus, colors, and logo. There’s never been a faster or easier way to create your own custom materials.